Somalis remove the body of a man killed in the blast. 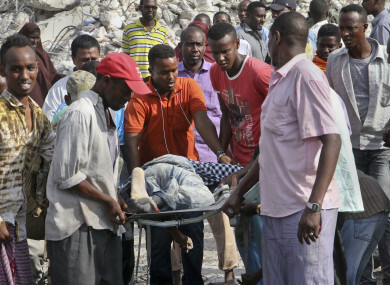 THE DEATH TOLL from the most powerful bomb blast witnessed in Somalia’s capital rose to 231 with more than 275 injured, making it the deadliest single attack ever in this Horn of Africa nation, a senator today. Doctors struggled to assist horrifically wounded victims, many burned beyond recognition. “The hospital is overwhelmed by both dead and wounded,” said Dr. Mohamed Yusuf, the director of Medina hospital. This is really horrendous, unlike any other time in the past. Ambulance sirens echoed across the city as bewildered families wandered in the rubble of buildings, looking for missing relatives. “In our 10 year experience as the first responder in #Mogadishu, we haven’t seen anything like this,” the Aamin Ambulance service tweeted. Angry protesters gathered near the scene of the attack as Somalia’s government blamed the al-Qaida-linked al-Shabab extremist group for what it called a “national disaster”. “They don’t care about the lives of Somali people, mothers, fathers and children,” Prime Minister Hassan Ali Khaire said. They have targeted the most populated area in Mogadishu, killing only civilians. The United States condemned the bombing, saying “such cowardly attacks reinvigorate the commitment of the United States to assist our Somali and African Union partners to combat the scourge of terrorism”. But the US Africa Command said US forces had not been asked to provide aid. A spokesman told The Associated Press that first responders and local enforcement would handle the response and “the U.S. would offer assistance if and when a request was made”. The United Nations special envoy to Somalia called the attack “revolting,” saying an unprecedented number of civilians had been killed. Michael Keating said the UN and African Union were supporting the Somali government’s response with “logistical support, medical supplies and expertise”. Yesterday’s blast occurred two days after the head of the US Africa Command was in Mogadishu to meet with Somalia’s president, and two days after the country’s defense minister and army chief resigned for undisclosed reasons. Email “Over 230 dead and 275 injured in worst single attack in Somalia's history”. Feedback on “Over 230 dead and 275 injured in worst single attack in Somalia's history”.